Some of these pursuits are represented in a fine, illustrated manuscript by Müller, held by the Wellcome Library (MS.3644) and now digitised and freely available in our media player. At the front of the manuscript he included this picture which undoubtedly speaks to his final sentence. Worms have picked the last vestiges of flesh from the skeleton of what appears to have once been a bishop, his mitre carefully set beside his skull. Filthy toads lurk beneath his raised legs. Various admonitory inscriptions in French and Latin decorate the scene. 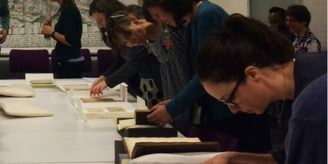 For those of you planning to visit London, Müller’s manuscript has also been recreated in facsimile together with a number of other Wellcome manuscripts, and can be viewed in the newly opened Reading Room at Wellcome Collection.